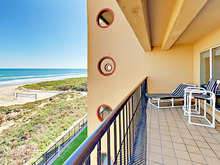 Memorable vacations begin at this 3BR/2BA condo for up to eight guests. Enjoy a comfortable stay with newly updated interiors and high-end finishes. Spend time on your expansive gulf-front balcony, and make use of the heated pool, hot tub, tennis court, BBQ grills, and beach volleyball nets. Ready to explore the island? Find yourself within easy walking distance of South Padre Island dining and nightlife, from casual seafood joints to seaside watering holes. After sun-soaked vacation days beside the glittering Gulf, return home to your spacious, newly updated condo. The main living area is bright and inviting, with seating for five on the sleeper sofa and two plush armchairs. Kick back to watch the 40” flat screen TV, or witness a breathtaking Gulf sunset on your expansive balcony. Whip up dinner in the granite kitchen with stocked white cabinetry, full-size appliances, and breakfast bar seating for three. Then, savor your home cooking at a sleek dining table set for six. When you’re ready to call it a night, sleep comfortably in your ocean-view master with king-size bed, walk-in closet, 32” flat screen TV, and en-suite bath with glass shower. Drift to sleep in the second bedroom with a queen bed, a mirrored closet, and a 32” flat screen TV with DVD player. Or rest up in the third bedroom, configured with one queen bed, one twin bed, and a 19” flat screen TV. Next door, the guest bathroom features a tub/shower combination. Extras at this unit include complimentary Wi-Fi, coin-operated laundry, and onsite parking for one car. During your stay, make use of the resort-style complex amenities, including the heated pool, hot tub, sun deck with palapas, tennis court, grilling area, and beach access with volleyball or badminton nets. As a guest at Suntide II Condominiums, you’ll be treated to private beach access, with the shore just steps away. Forgot your beach towel or need a nap? No problem—your condo’s proximity to the beach makes it a breeze to go back and forth. You’ll also enjoy Suntide II amenities like a heated beachside pool, a hot tub, a sun deck with palapas, a tennis court, beach volleyball, and a truly Texas-sized BBQ area. For seafood and happy hour specials just down the street, swing by Blackbeard’s, a neighborhood mainstay since 1978. After dinner, head across the street to pick up an ice cream at Dolce Roma. Or stop by WannaWanna (10-minute walk) for pub fare, live music and frozen cocktails on a beachfront deck. Adventurers can check out South Padre Island Watersports (5-minute drive), where you can rent bikes, kayaks, paddle boards, and more. And Schlitterbahn Waterpark is just a 10-minute drive away. For quick grocery pick up, you’re just a mile from Blue Marlin Supermarket.